Apps such as Tasker and Llama are enthusiast-favorites when it comes to automating tasks, but because of their relatively difficult to use user-interfaces, it’s a little hard to get into setting them up. If you’re looking for a simple automation app that lets you silence your phone during a particular part of the day, look no further than Silent Time! Silent Time automatically silences your phone based on your weekly schedule. You can also add exceptions to let important calls through. Silent Time offers the most simplistic UI of all the custom profile apps we’ve covered so far, and for obvious reasons: instead of letting the user create profiles based on things like Wi-Fi coverage, battery life left, location and other particular conditions, its profiles are based on time and time alone. In this way, it’s more like Timeriffic, but even simpler in that you can only edit when the phone/tablet should remain silent. I really liked the app because of its simplicity. Setting it up was a breeze; I chose the profile name, its start/end time, days of the week and whether to vibrate the phone on notifications or not. If you don’t want to miss important calls, you can add “exceptions”. When these exceptional people call you, your phone will ring normally. 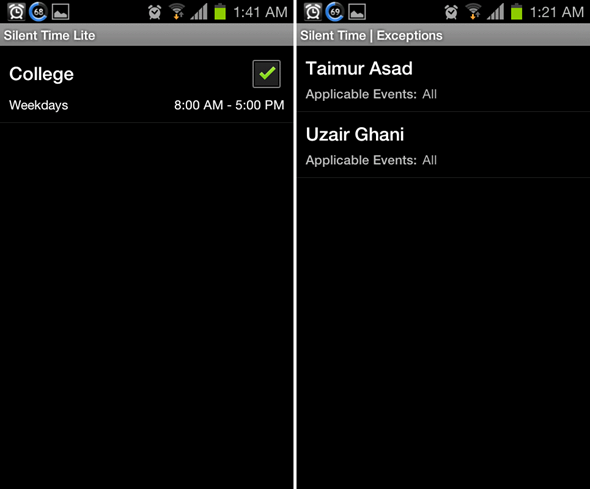 Silent Time is available in two versions: a free “lite” version and a$1.99 “pro” one. Because the developer hasn’t mentioned it on Google Play or anywhere inside the, I have no idea of the difference between the two versions but you may think of the “pro” as a donate version to help financially support the developer, or maybe, it has minor functionality limitations, which we didn’t come across to be quite honest. But, its always a good idea to support the developer wherever possible. Be sure to let us know what you think of Silent Time by leaving a comment over on our Facebook and Google+ page.